For people in parts of Somerset, Sunshine Coast and Moreton Bay Council Areas. Issued at 4:41 pm Tuesday, 12 February 2019. Potential severe thunderstorms near Woodford and Kilcoy. The Bureau of Meteorology warns that, at 4:30 pm, severe thunderstorms were detected on the weather radar near the area west of Kilcoy and Mount Beerwah. These thunderstorms are moving towards the east to northeast. 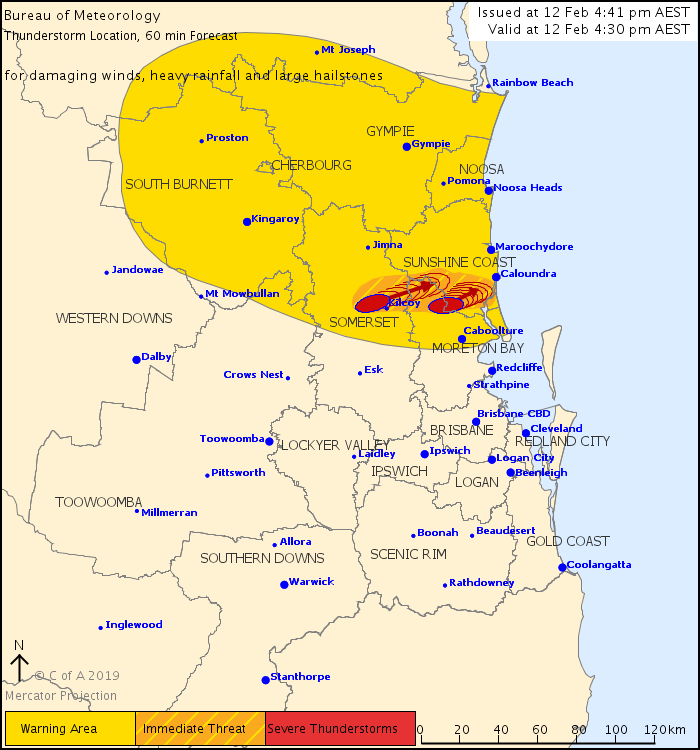 They are forecast to affect Mount Kilcoy and the area north of Woodford by 5:05 pm and the area southwest of Caloundra, Beerwah and Crohamhurst by 5:35 pm.